MOMMY slithered her skinny body through the doorway and exposed herself to the three of them, staring at them as they huddled together in desperation for warmth. Mommy took a step closer, and Bella stared up at her, her grip tightening around Cole&apos;s torso as Mommy stopped to kneel in front of them. Bella noticed Elliot and Cole were both asleep, their eyes closed and their chests rising in a soft rhythm, but Bella was shaking. She was exhausted as well, and just wanted for Mommy to leave her alone so she could get a little bit of rest. Mommy tilted her head to her side, her straw-like hair falling to her shoulders as her tiny eyes scoured over Bella. "I must separate you from them," Mommy said gently to Bella, her thin fingers brushing over Bella&apos;s exposed shoulder. Bella shuddered instantly at the contact, and she blinked up at Mommy. "Don&apos;t," Bella heard Cole mumble under his breath, his eyes fluttering open slightly as he looked at Mommy. 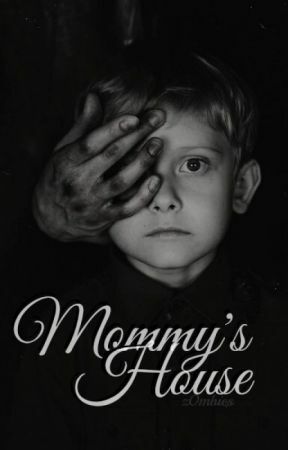 "Please don&apos;t."
"It&apos;s not a choice," Mommy grinned at Cole, exposing her rotting teeth as she reached over to stroke the back of her hand against his cheek. Cole flinched away from her touch, blinking in confusion. "Hmm," Mommy hummed in thought. "We must get you cleaned up at some point. You are growing facial hair, and my little boy is not allowed to become a man yet." Cole took a deep breath, and Bella could tell he was about to say something rude to Mommy, so she whispered for him to stop. Bella shifted her body away from Cole, frowning at the loss of warmth from the contact they previously had, as Mommy straightened her legs. Mommy smiled at Bella, grabbing her hand and helping her to stand up. "You are obeying me?" Mommy asked, her grin turning devilish as she narrowed her eyes. Bella swallowed and nodded, looking down at Cole and Elliot. Cole&apos;s eyes stared up at her, their blue tint turning dull almost right before her eyes as they filled with sorrow and muted anger. Bella shook her head at him, a tear falling from her eye as she grabbed Mommy&apos;s hand. "At least take the kid with her too," Cole begged suddenly, his voice hoarse as he stared at Elliot peacefully sleeping. "He... he wouldn&apos;t want to not be with her." Mommy cackled under her breath, closing her eyes in elation as she dismissed Cole&apos;s request instantly. "I am separating her so she can control herself around you boys. She must be alone if she wants to change her slutty ways." Bella couldn&apos;t stop the stream of tears falling from her eyes as she stared at Cole. She didn&apos;t want to be away from them; she would surely lose her mind being isolated. Mommy lead Bella out the door, and she heard Cole exhale heavily just before she exited the room and stepped into the basement corridor. She folded her arms around her chest and rubbed them for warmth as Mommy, surprisingly, brought her up to the staircase. Bella sniffled and wiped a tear off her cheek as she walked up the stairs behind Mommy. When they reached upstairs again, she noticed the sky had shifted to nighttime, and the only illumination in the kitchen was the dim lamp beside Mommy&apos;s boyfriend who had been seated at the table. Bella stared around the dirty house in confusion as Mommy slammed the basement door shut behind her. She pointed to a chair at the table across from her boyfriend. Her boyfriend had his hood up, as usual, but she could see more of his mouth shape, his pointed chin, and his skinny nose. She could see a piece of a dark tattoo coming from the collar of his sweatshirt and trailing up the side of his neck.